❤️ Always Safe. Straw by Blauw BPA free, dishwasher safe, and great for kids. ❤️ Always Fresh. Straw by Blauw comes with a cleaning squeegee inside the case so your straw is always clean. ❤️ Zero Waste. Straw by Blauw is designed to last. Join the movement and help the environment. ❤️ Kid Friendly. Straw by Blauw is great for kids and adults and fits easily in cups, glasses, and bottles and is great for usage at home, work, school, or while traveling or camping. ❤️ Multi-Usage. Perfect for most 20oz tumblers, ramblers, cups, and mugs such as YETI, RTIC, Ozark trail, glass, short cocktail glass etc. The Problem With Plastic. Plastic straws can't be recycled. Plastic straws don't decompose, and they pollute our land and oceans. We can stop this problem straw by straw! 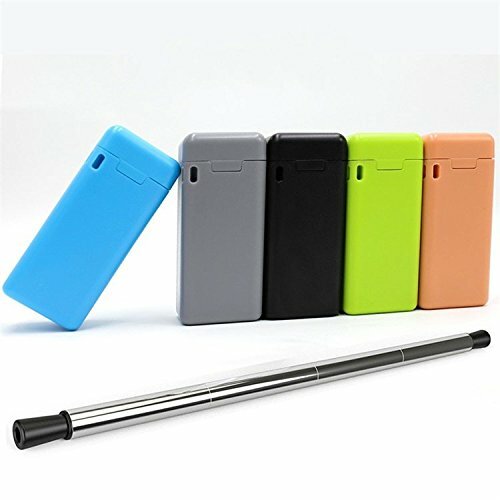 ECO-FRIENDLY REUSABLE STRAW: This clean and compact foldable straw is made of eco-friendly and BPA free materials. The body of the straw is stainless steel metal and the tubing and tip of medical and food grade materials. FOLDABLE INNOVATE DESIGN: This collapsible straw self-assembles and folds into 4 pieces back into a small portable sturdy case made of recycled materials. This straw goes where you go because it fits on your keychain. SAVE MONEY AND THE ENVIRONMENT: Join the movement and stop using plastic straws with this zero-waste straw. By reusing this easy to clean and dishwasher safe straw, you will feel good, save money and the environment at the same time. LIGHTWEIGHT PORTABILITY AND FUNCTIONALITY: This foldable straw is great for kids and adults and fits easily in cups, glasses, and bottles and is great for usage at home, work, school, or while traveling or camping. EASY TO CLEAN: Your straw comes with a cleaning squeegee inside the case. Finally, there is a straw that is reusable, foldable, collapsible, easy to clean, and convenient. If you have any questions about this product by STRAW BY BLAUW, contact us by completing and submitting the form below. If you are looking for a specif part number, please include it with your message.